I love a great hot sauce! You will always find several different hot sauces in my pantry, two of my favorites are my green Harissa and my Israeli hot sauce . Each hot sauce in my collection has a different level of heat. Some are very pleasant and give me that little kick, while others will give me tunnel vision and tears will run down my cheeks. Lacto fermentation delivers intense and complex heat. My Fresno pepper hot sauce includes the seeds of the peppers. So be warned, the sauce packs quite a punch. Lacto-fermentation is an ancient method of food preservation that has been around for thousands of years. Not long ago, fermentation was the way to have food for the winter. The excess harvest was lacto-fermented and preserved for the winter months. How things have changed in our days, instead of the lacto fermented nutrient rich foods full of enzymes and probiotics, the average diet today consists mainly of sugar laden, lab created and highly manufactured foods. FYI, my hot sauce only needs salt, water and red Fresno peppers. That’s it! Be sure to use a high quality sea salt and do not use treated water, the chlorine is harmful to the fermentation, spring water is what you want to use. Oops, one more thing that I almost forgot, time. You can’t ferment without time. I let my peppers age for one week in a Mason jar with the lid tightly closed. After the second day, the mix starts bubbling and you know the fermentation has begun. Some suggest to ferment a hot sauce for up to a month, however, one week is long enough for me. 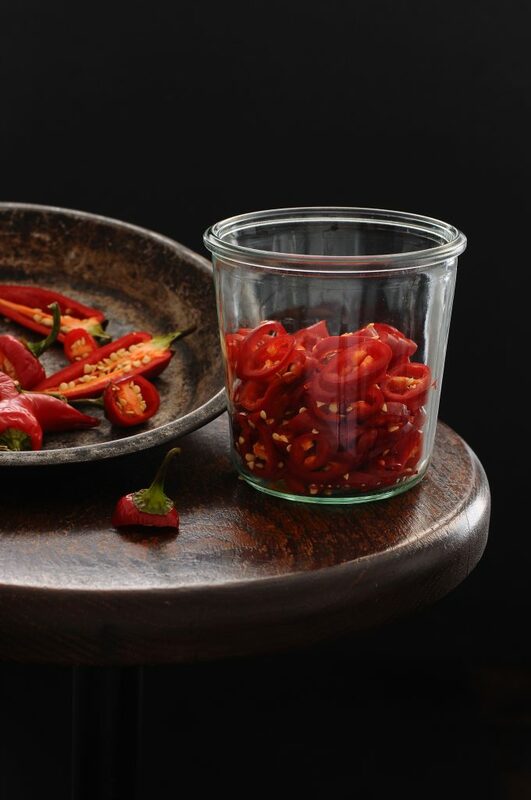 The fermentation changes the flavor of the hot sauce, adding a much more complex tangy layer. The salt water brine creates an anaerobic environment (free of oxygen) where only lactobacillus bacteria can survive. The lactobacillus bacteria act as a preservative, keeping harmful bacteria from living in the ferment. The process works because of the fact that harmful bacteria can’t tolerate much salt, but there are healthy bacteria that can. In stage two of lacto-fermentation, the lactobacillus organisms begin converting lactose and other sugars present in the food into lactic acid. 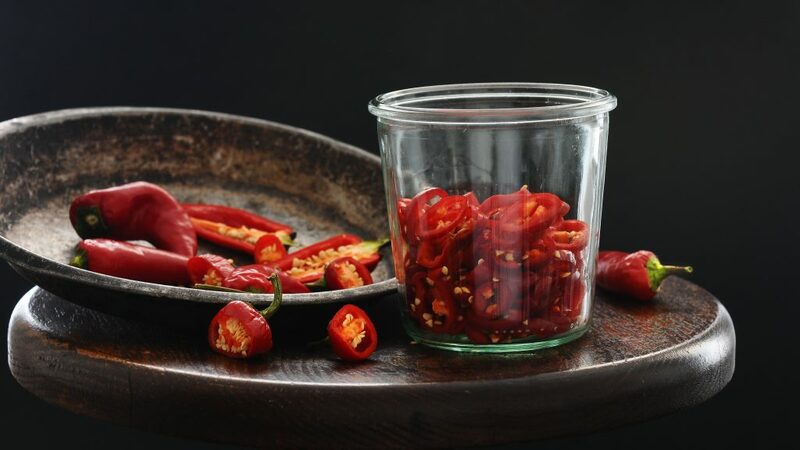 This creates an acidic environment that safely preserves the vegetables — and gives lacto-fermented foods their classic tangy flavor. Fresno chilies are shaped very similar to jalapeño chilies and they can easily be mistaken for the red jalapeño. They are available in red and green varieties, the red being the sweeter of the two. On the chili heat scales, they rate a 4 – 6 out of 10. Choose bright colored, glossy peppers that are firm with medium to thick flesh, avoid soft spots. Store refrigerated, unwashed in a plastic bag for up to 5 days. I have to mention it, even so I know everyone is aware of it, be very careful when you are handling fresh chili peppers; I recommend wearing vinyl kitchen gloves. Otherwise, if you don’t properly wash your hands after handling the peppers, they can really hurt your skin, lips and be sure to avoid touching your eyes. 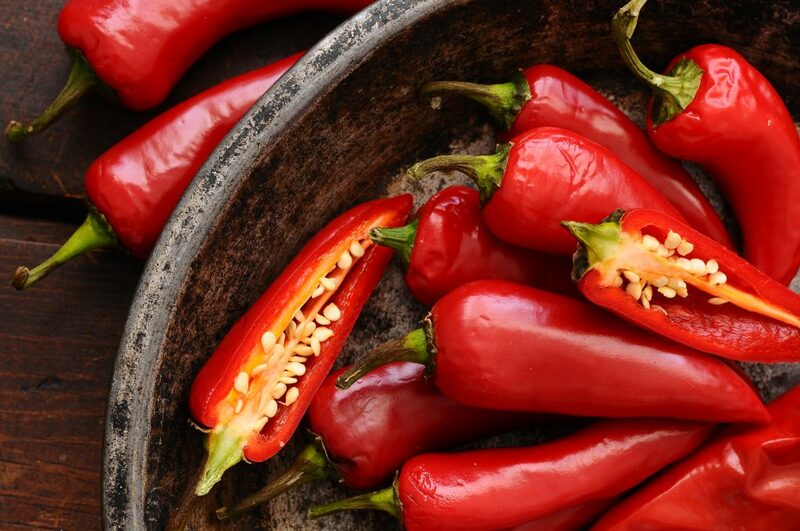 Chili peppers have demonstrated health benefits. They are packed with vitamins A & B and are also a good source of vitamin C. They are free from cholesterol and saturated fats, low in calories and high in fiber. All of this plays an important role in keeping our bodies running like a well-oiled machine. No worries lacto-fermented foods are safe to make at home. 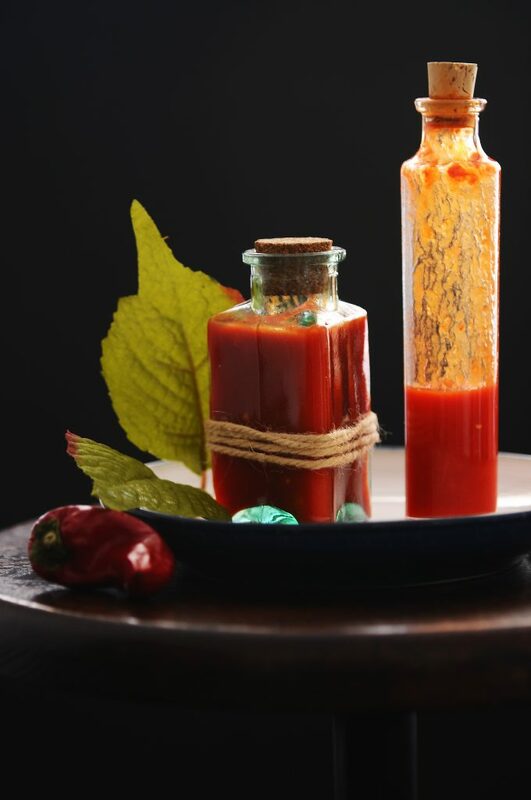 Allow the hot sauce to ferment at room temperature. You will know if something goes “bad” the signs will be there, mold or a horrible smell will tell you that it’s time to make a new batch. Lacto-fermented foods are naturally preserved foods. They are made without heat, so you will never get the same storage time that you get with canned food. However, this is a great trade off, since you get all of the live probiotics, enzymes and vitamins that are destroyed in heat and canning. 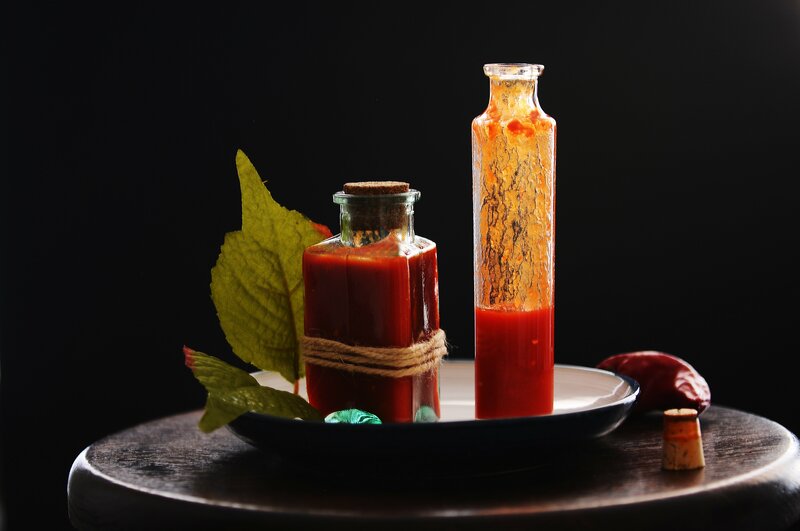 Lacto-fermented hot sauce is not a shelf stable sauce. Kept in the refrigerator it will keep for 4 to 5 months. I’m not worried about shelf life, since the small batch I make is gone in no time. Enjoy and move forward with confidence, lacto-fermentation is easy! Blend fermented hot sauce with honey, add a little granulated sugar for an additional sweetness and you have a great dipping sauce. Smash garlic lightly with back of French knife and peel. Remove stem from peppers and slice peppers into rings. Make the brine by heating up 1 cup of purified water with 1/2 tablespoon of good quality sea salt. Stir the brine until salt is dissolved and let the brine cool to room temperature. Place the sliced peppers and smashed garlic in a Mason jar. Pour brine into Mason jar, to cover the peppers and the garlic. Make sure peppers are covered with brine. Cover Mason jar tightly with lid and set in cool place. Shake jar daily to prevent mold from forming. After about two days, small bubbles will start to build and the fermentation process has started. Ferment for 1 week or longer. 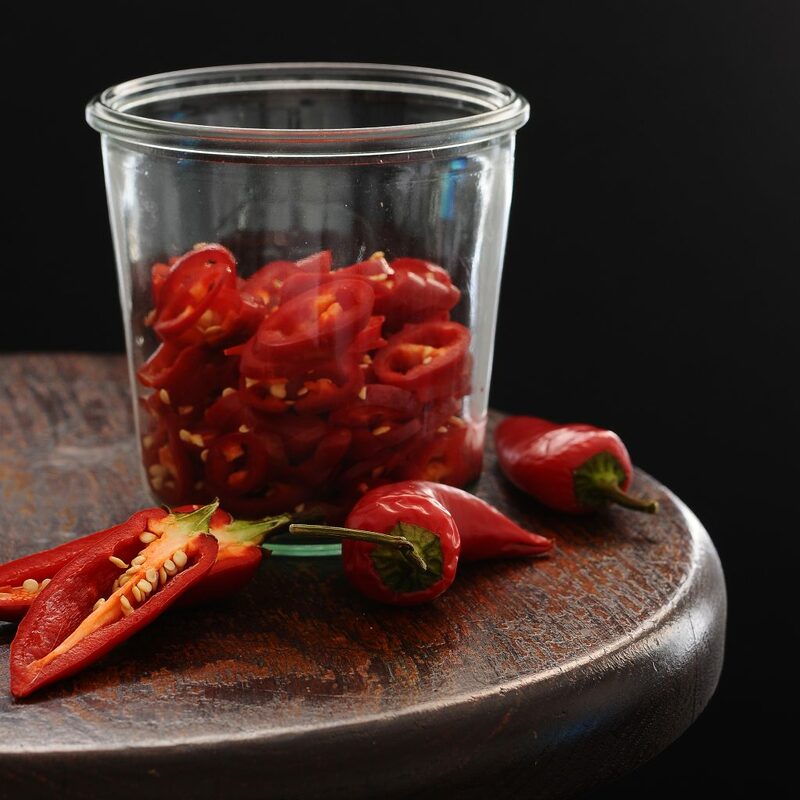 Once fermentation is complete, drain and reserve brine and place peppers and garlic in a food processor, add brine as needed. Add brine a tablespoon at a time until it reaches desired consistency. Transfer to a Mason jar cover with lid and keep in refrigerator.